Click each title to view job description and qualifications. Thank you for your interest in a position with the San Antonio Humane Society. To be considered you must fill out an online application. Resumes can accompany an application, but not required unless requested. Contacting the reporting supervisor will not increase your chances of an interview. Please follow the directions. Only those whose skills and experience meet the minimum qualifications will be considered for an interview. The minimum age requirement for employment at the SAHS is 18. You will only receive a call if you are considered for the position. No phone calls, please. Are you looking to gain experience working in a non-profit? The San Antonio Humane Society is occasionally offering unpaid internships in multiple departments. These internships will help you acquire new skills in your field of interest, give you valuable work experience in a 501c non-profit organization, and have you working to help find homes for our San Antonio dogs and cats. To be an intern at the SAHS, it's required that you are also a volunteer with us. Veterinary Students & Advanced Training for Licensed Veterinarians is temporarily put on hold! 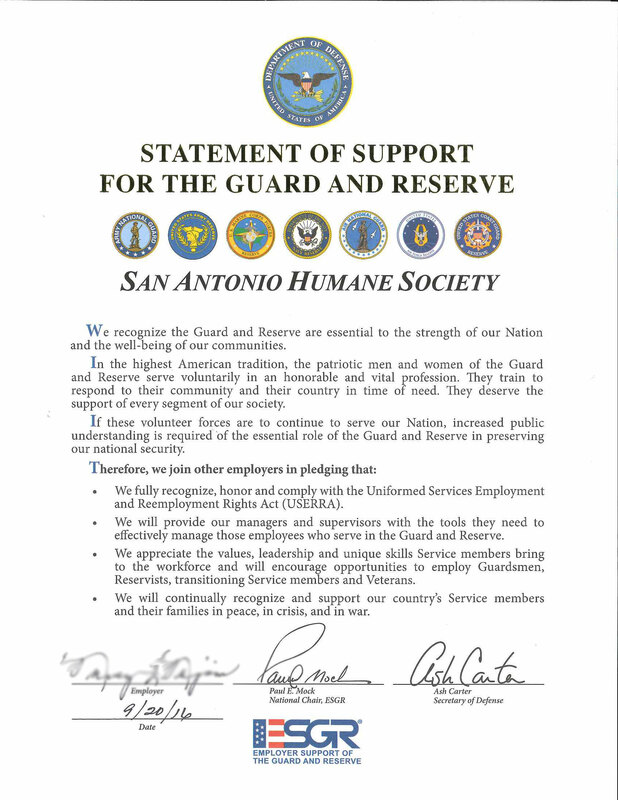 The San Antonio Humane Society is proud to show our Statement of support for the guard and reserve.